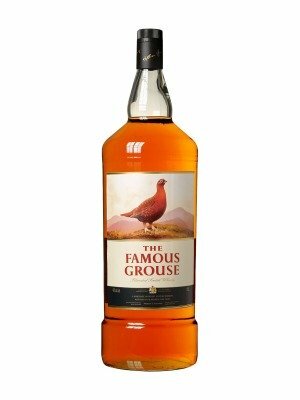 The Famous Grouse Highland Blended Scotch Whisky is a popular Whisky available from DrinkSupermarket.com in 4.5lt to buy online. Visit DrinkSupermarket.com for the best price for 4.5lt of The Famous Grouse Highland Blended Scotch Whisky or compare prices on our other Whisky products. The Famous Grouse is a mingled of high caliber grain and malt whiskies. The perfume is bright and stimulating, with notes of freshly cut flowers. Balanced on the palate with hints of spice, toffee and a touch of smoke. You can buy The Famous Grouse Highland Blended Scotch Whisky online in most retailers and find it in the Whisky aisle in supermarkets but we found the best deals online for The Famous Grouse Highland Blended Scotch Whisky in DrinkSupermarket.com, TheDrinkShop, and others. Compare the current price of The Famous Grouse Highland Blended Scotch Whisky in 4.5lt size in the table of offers below. Simply click on the button to order The Famous Grouse Highland Blended Scotch Whisky online now.